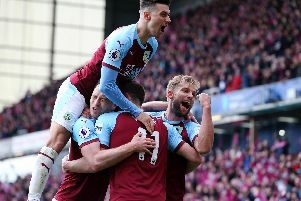 Tickets for Burnley’s Emirates FA Cup third round tie at runaway Premier League leaders Manchester City’s Etihas Stadium on Saturday, January 6th (kick-off 3 p.m.) are on sale. Tickets are priced: Season Ticket Holders – Adults: £10, Over 65: £10, U22: £10, U18: £5; Non-Season Ticket Holders – Adults: £15, U22: £10, Over 65: £10, U18: £5. Tickets are on sale to season ticket holders with 3,000 points online only from today at 5 p.m., and the Ticket Office from 9-15 a.m. tomorrow. They then go on sale to season ticket holders online only from Saturday, at 7 p.m., and the Ticket Office from Wednesday, December 27th at 9-15 a.m.
General sale is online only from Saturday, December 30th at 12-30 a.m. and the Ticket Office from Tuesday, January 2nd at 9-15 a.m. The final day for posting is January 3rd at 2 p.m. If you are registered as a disabled supporter and looking to purchase tickets for this game, you can now purchase tickets at 9 a.m. on the same day as the online priority period, as mentioned above. If you would like to purchase disabled tickets, please visit the ticket office at Turf Moor or call 01282 446800.